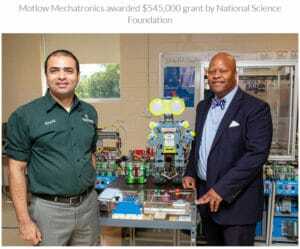 In late summer 2018, the Motlow State Community College (MSCC) in Tennessee and Mechatronics Professor Khalid Tantawi was awarded a National Science Foundation (NSF) Advanced Technological Education project grant to advance Smart Manufacturing concepts. Joining that $545,000 grant project as a Co-Principal Investigator is Dr. Ismail Fidan, from Tennessee Tech University and a TEAMM Network member. In recent years, organizations, such as, The World Economic Forum has been studying the “Fourth Industrial Revolution,” also known as Industry 4.0, or in the USA – “Smart Manufacturing.” It seeks to change how we currently manufacture by employing advanced sensors, computer controls, big data (and the modeling and analysis of it) and other automation technologies to make manufacturing more efficient. According to a release from MSCC, “The project, titled “Smart Manufacturing for America’s Revolutionizing Technological Transformation” will feature Motlow as a national hub for training Smart Manufacturing for Mechatronics and Advanced Manufacturing educators across the nation.” You can learn more about it here. One of the successful aspects to many National Science Foundation grant projects is that the Advanced Technological Education (ATE) program creates opportunities to collaborate across multiple educational institutions and disciplines as well as between professors at those schools. The TEAMM Collaboration Network is a terrific example of this cross pollination with its diverse 30-plus network members across 2-year community colleges, 4-year colleges and universities, as well as other education, nonprofit, and corporate entities. The smart manufacturing project with Motlow is clearly an example as are programs like another Dr. Fidan project profile here on AM News: Additive Manufacturing – Workforce Advancement Training Coalition and Hub (AM-WATCH). Or head directly to Dr. Fidan’s profile which lists the many ways that he collaborates with and supports his colleagues at TTU, TEAMM Network Members and other institutions. With an emphasis on two-year Institutions of Higher Education (IHEs), the Advanced Technological Education (ATE) program focuses on the education of technicians for the high-technology fields that drive our nation’s economy. The program involves partnerships between academic institutions (grades 7-12, IHEs) and industry to promote improvement in the education of science and engineering technicians at the undergraduate and secondary institution school levels. The ATE program supports curriculum development; professional development of college faculty and secondary school teachers; career pathways; and other activities. The program invites research proposals that advance the knowledge base related to technician education. It is expected that projects will be faculty driven and that courses and programs credit bearing, although materials developed may also be used for incumbent worker education. Karen Birch: Professor at Tunxis Community College and director of the NSF ATE funded Regional Center for Next Generation Manufacturing, Connecticut. As 2019 gets into full swing, it is good to recap a few of the many contributions that materials technology education brings to our community. Edmonds Community College is home to the The National Resource Center for Materials Technology Education (MatEdU), The Facility makerspace, and a host of other programs and initiatives. In addition, it is where the Technician Education in Additive Manufacturing & Materials project, also known as TEAMM, sponsor of this AM News site, is based. Materials Technology Education is a big focus at Edmonds and the recipient of nearly $11 Million in grant awards from the National Science Foundation (since 2000). 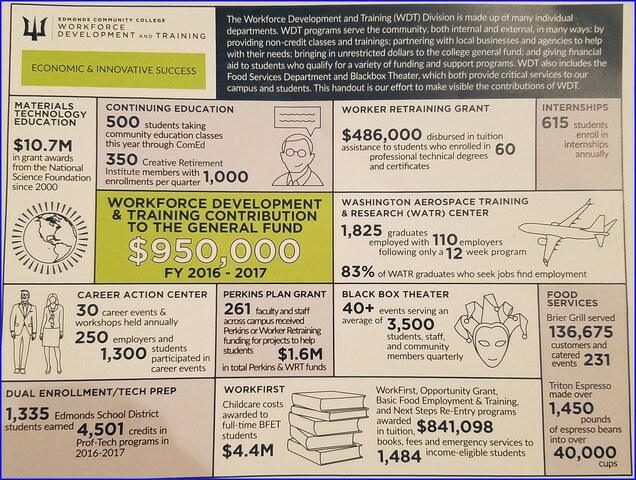 The two nationally known projects listed and linked above are also augmented by many other Workforce Development and Training efforts in the region (the Edmonds Community College Workforce page is a good resource). Not all of them are specifically about additive manufacturing and materials science, our focus at AM News, but all of them serve to help students reach their goals for education and a career. The M-STEM national workshop takes place at a different location each year offering educators and students a way to learn about or teach materials science. The Veterans Resource Center (VRC) located on the second floor of Lynnwood Hall in Room 215, offers a variety of benefits for veterans starting or returning to college. Executive Director, Chris Szarek, recently joined in the special Veterans Day Weekend Guitar Building Institute Workshop, helping current students and community veterans as they practiced material science as they built electric guitars. The Facility, one of the first makerspaces to give access to both Edmonds Community College students and area residents who want to utilize this cutting-edge manufacturing lab. It includes a Rapid Prototyping lab (3D printers and laser cutters), Autoclave, CNC Mills and Router, Computer Design Lab, and a Composites Lab; just to name a few of the machines available to students and community members. More informal training occurs in many of the courses offered as part of the user experience. As 2019 steams forward, remember that Monroe Hall and many other efforts at Edmonds Community College are creating or are part of larger Workforce Development and Training initiatives in a local and regional way as well as at the Washington State level. Check out your local community college for programs and projects that will help you in your career development. During a time when manufacturing is changing in massive ways, there is a predicted labor shortage with estimates as high as two million additional skilled workers needed by the year 2020. Author Sarah Boisvert is co-founder of the commercial division of Potomac Photonics Inc. of Baltimore, Md., where she worked to commercialize a proprietary radio frequency (RF)-discharge excimer laser. She is no stranger to the need of manufacturers to find skilled workers. 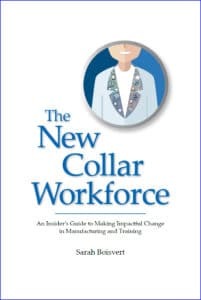 Her new book, published by Photonics Media Press, The New Collar Workforce, is turning the traditional workforce training model on its head. Armed with 200 manufacturing industry executives’ interviews, Boisvert gets to the heart of the skills gap, and defines a path to engaging, well-paying jobs in the cool digital factory. The “new collar” workers that manufacturers seek have the digital skills needed to “run automation and software, design in CAD, program sensors, maintain robots, repair 3D printers, and collect and analyze data,” according to the author. Educational systems must evolve to supply today’s changing digital manufacturers with new collar workers, and this book leads the reader to innovative organizations that are recreating training programs for a new age in manufacturing, also known as Industry 4.0. Master Badges such as 3D Printing Operator or Laser Service Technician are part of training process that culminates in a stack of Digital Badges that certify a higher level of skill. AM News frequently researches and publishes about workforce training programs (TTU runs the NSF-funded AM-WATCH program that hosted an Additive Manufacturing Studio). If you know of one or conducting one at your institution, we would like to hear from you. Contact information below. For the past couple of years, the Center for Manufacturing Research at Tennessee Tech University (TTU) has been hosting short talks by Additive Manufacturing experts in the field. These lectures are available for students directly on campus in the iMakerSpace in the Volpe Library on campus, but also online in a webinar format from anywhere using the Zoom platform. Although it is already passed (Sept 13), the session: “Integrating Additive Manufacturing into CAD Courses” shared by Tom Singer at Sinclair Community College in Dayton Ohio was a popular one. Professor Singer is well known for his STEM Guitar Building Institute where students build an electric guitar during a one-week workshop. The Institute is also a member of the TEAMM Network, sponsor of AM News. There will be a Guitar Building Summit from November 3-5 leading into the upcoming annual M-STEM (Materials in STEM) workshop on November 5 and 6, at the University of Alabama – Birmingham. The Golden Eagle Additively Innovative Virtual Lecture Series is partially funded by the NSF Award 1601587 “AM-WATCH: Additive Manufacturing-Workforce Advancement Training Coalition and Hub”. For more information contact Ismail Fidan, Ph.D., Professor, Innovation and Techno-Entrepreneurship Faculty Fellow, Manufacturing and Engineering Technology, Tennessee Tech University. AM News covered the Spring 2018 Additively Innovative Lecture Series here. The 25th Anniversary of the National Science Foundation’s (NSF) Advanced Technological Education (ATE) program is a reason to celebrate in STEM (Science, Technology, Engineering, and Mathematics) education circles. For 25 years, the ATE program has invested in and grown technician education opportunities around the nation to prepare a “STEM-capable workforce.” That includes many different types of classes, modules, and certificate programs, in addition to traditional two-year degree programs that are already a strong part of the community college system. All of these efforts focus on technician education, across the USA, to help students graduate, but also to help high tech employers in the workforce. Many of the programs highlighted in the annual report called “Impacts” are part of the TEAMM network, which is the sponsor of AM News. Throughout this coming 2018-2019 academic year, we are going to highlight the network member programs as found in Impacts and through direct interviews, when possible. According to Impacts: “AM-WATCH provides opportunities for secondary school and two-year college students and educators to learn additive manufacturing technologies. More than 700 students were impacted positively by the project from fall 2017 to spring 2018.” It plans to add more locations to its existing 25 learning sites in Tennessee and Washington. MatEdU is well-known as a materials technology education repository for educators and students. It appears in the number one spot for search engine results for a wide variety of materials science terms and directs students and educators to useful resources. Students can learn about a variety of career pathways in materials science. Educators can find content that helps them plan a variety of lessons, entire courses as well as core competencies documents outlining required depth of proficiency for a range of related subjects, such as, manufacturing technology, corrosion technician, nanotechnologist, and more. Instructional resources include course designs, materials videos, and recommended book lists, to name just a few items from the Instructional Resources page. Each year, MatEdU organizes a Materials in STEM conference (two days) known as M-STEM that attracts educators and students around the country. This year is hosted by the University of Alabama – Birmingham on November 5 and 6. 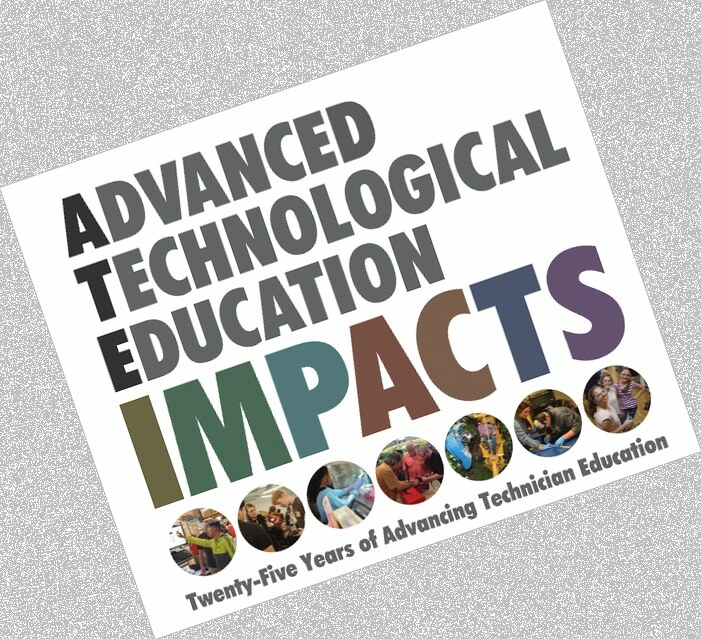 You can read more about all of the ATE Centers and many of the featured projects by visiting ATE Impacts where you can download the digital edition (PDF) of ATE Impacts 2018-2019.